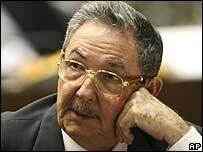 Raul Castro has been unanimously selected to succeed his brother Fidel as leader by Cuba's National Assembly. Fidel Castro stepped down last week after nearly half a century in charge. Raul has in effect been president since Fidel had major surgery in July 2006. It is understood that he was the only nominee in a vote seen as a formality. The US said Raul Castro's appointment offered potential for change but said its embargo would remain until there was a transition to democracy. "There is a possibility and potential for change in Cuba, but those changes will have to be born inside Cuba," said Assistant Secretary of State Tom Shannon. There had been speculation that Raul Castro, aged 76, would name one of Cuba's younger generation of communist leaders as his number two. But he instead opted for one of the original leaders of Cuba's communist revolution, 78-year-old Politburo hardliner Machado Ventura as first vice-president. What this means for the prospects for change remains unclear, the BBC's Michael Voss in Havana says. In an address to the nation, following the behind-closed-doors vote, Raul Castro said the Cuban government would continue to consult Fidel Castro, 81, on major decisions of state - a move backed by the National Assembly deputies. Raul Castro paid tribute to his older brother as he accepted the presidency and said that he was accepting the job on the understanding that Fidel Castro would remain as the "commander in chief of the revolution", a title he was given during the 1959 uprising. "The commander in chief of the Cuban revolution is unique, Fidel is Fidel, as we all know well, he is irreplaceable," Raul Castro said. Our correspondent says Raul Castro now has to steer the Caribbean island through un-charted waters in an unpredictable period of economic and political renewal. Before Sunday's session, Raul Castro had suggested implementing major economic reforms and "structural changes". He has worked to ensure a smooth political transition, keeping the army loyal to the regime and strengthening the Communist Party's hold by introducing reforms and weeding out corrupt officials. He has also had the advantage of continued economic support from Venezuelan President Hugo Chavez in the form of millions of barrels of cheap oil, our correspondent adds. Mr Chavez was quick to congratulate Raul Castro on his appointment, leading a standing ovation to the new Cuban president on his weekly television programme in Caracas. "Let's applaud Raul, who is a comrade, a companion, more than the brother of Fidel," Mr Chavez said. Mr Castro said that Venezuela would continue to support the communist state. Fidel Castro, who has ruled Cuba since leading a revolution in 1959, announced his retirement in a letter published on the website of the Cuban Communist Party's newspaper Granma last week. He said he had not stepped down after undergoing emergency intestinal surgery in 2006 because he had had a duty to the Cuban people to prepare them for his absence. But retirement, he added, would not stop him from carrying "on fighting like a soldier of ideas", and he promised to continue writing essays entitled Reflections of Comrade Fidel. Though he has not been seen in public for 19 months, the government occasionally releases photographs and pre-edited video of him meeting visiting leaders from around the world.